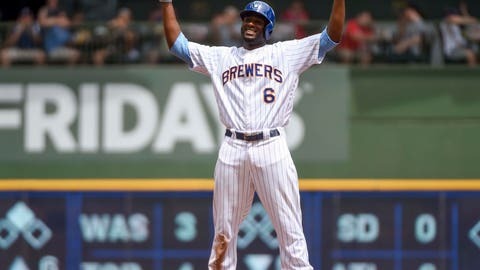 Sunday, June 17: Milwaukee Brewers center fielder Lorenzo Cain reacts after hitting a double to drive in a run in the third inning during the game against the Philadelphia Phillies. 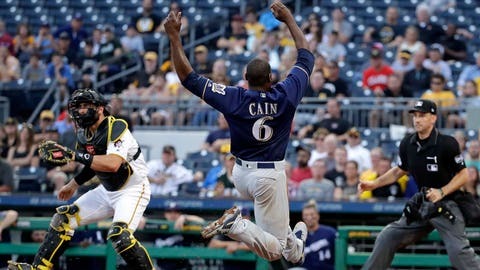 Tuesday, June 19: Lorenzo Cain slides into home plate, scoring on a RBI double by Jesus Aguilar during the Milwaukee Brewers’ 3-2 win over Pittsburgh. 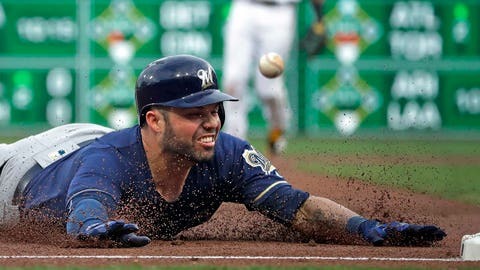 Tuesday, June 19: Manny Pina tallied his first career MLB triple during the Milwaukee Brewers’ 3-2 victory in Pittsburgh. 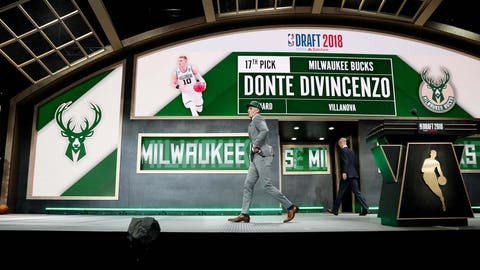 Thursday, June 21: Donte DiVincenzo walks across the stage after being selected by the Milwaukee Bucks with the 17th pick in the NBA Draft. 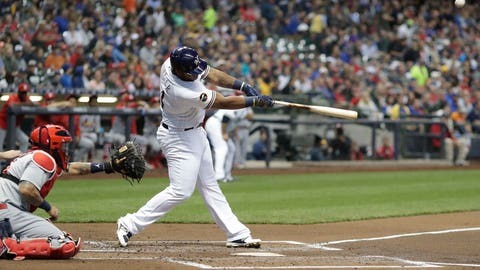 Thursday, June 21: Jesus Aguilar connects on a two-run double in the first inning of Milwaukee's 11-3 rout of the St. Louis Cardinals. 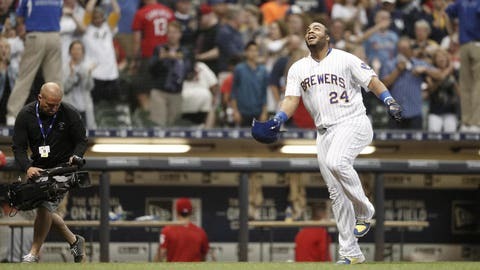 Friday, June 22: Milwaukee Brewers first baseman Jesus Aguilar rounds third base after hitting a walk-off homer to defeat the St. Louis Cardinals 2-1 at Miller Park. 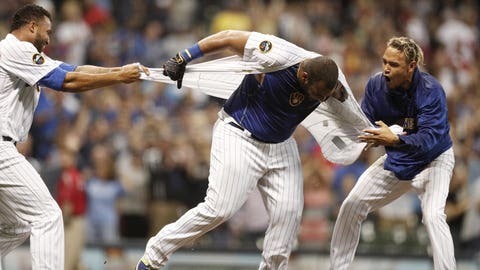 Friday, June 22: Domingo Santana and Orlando Arcia rip off the jersey of first baseman Jesus Aguilar after he launched two homers, including a walk-off winner, to lead the Milwaukee Brewers to a 2-1 win over St. Louis. 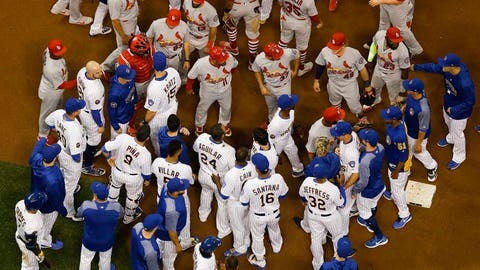 Friday, June 22: Players are separated at second base after benches cleared during the Milwaukee Brewers' 2-1 victory over St. Louis. 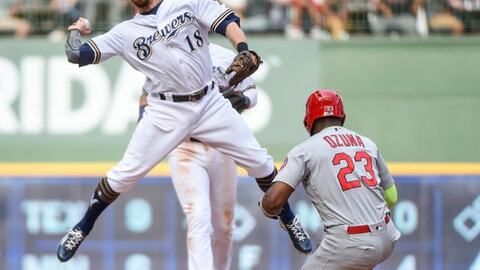 Saturday, June 23: Milwaukee Brewers second baseman Eric Sogard completes a double play after forcing out St. Louis Cardinals left fielder Marcell Ozuna. 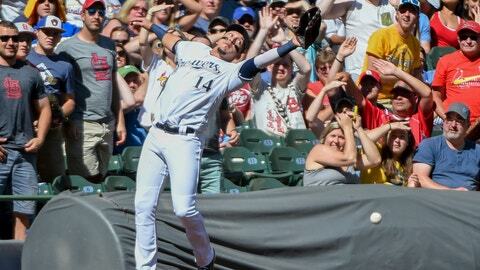 Saturday, June 23: Milwaukee Brewers shortstop Hernan Perez goes after a foul ball hit by St. Louis Cardinals third baseman Matt Carpenter.